Who's That Girl: Original Motion Picture Soundtrack is the first soundtrack album by American singer and songwriter Madonna. It was released on July 21, 1987 by Sire Records to promote the film of the same name. It also contains songs by her label mates Scritti Politti, Duncan Faure, Club Nouveau, Coati Mundi and Michael Davidson. The soundtrack is credited as a Madonna album, despite her only performing four of the nine tracks on the album. After the commercial success of the film Desperately Seeking Susan (1985), in which she co-starred, Madonna wanted to act in another comedy film titled Slammer, about a woman named Nikki Finn who was falsely accused of homicide. However, due to the critical and commercial failure of her adventure film Shanghai Surprise (1986), Warner Bros. were initially reluctant to green light the project, but later agreed, after Madonna convinced them and also because they wanted to cash in on Madonna's success with soundtracks. Madonna began working on the soundtrack in December 1986, and contacted Patrick Leonard and Stephen Bray, who had worked as producers on her third studio album True Blue (1986). She felt that an uptempo song and a downtempo song were needed for the album. Leonard composed the music for the uptempo song, with Madonna providing the melody and lyrics. The singer named the track "Who's That Girl" and, believing this to be a better title than Slammer, changed the name of the film to the same. Together, Madonna and Leonard also developed the downtempo ballad "The Look of Love". Two more songs were composed for the film with Bray, the first being the dance-y tune "Causing a Commotion", and the other being "Can't Stop", a track inspired by Sixties Motown and the group Martha and the Vandellas. After its release, the Who's That Girl soundtrack received a mostly negative response from critics. Some reviews described the album as plain and incomplete, although the title track and "The Look of Love" were praised as its highlights. The soundtrack was a commercial success, reaching the top ten of the album charts of the United States, Austria, Canada, France, Italy, New Zealand, Sweden and the United Kingdom, while topping the charts of Germany, and European Album chart. The album went on to sell 6 million copies worldwide. Three of the Madonna tracks were released as singles. The title track became her sixth number one single on the Billboard Hot 100, making her the first artist to accumulate six number-one singles in the 1980s, and the first female performer to get that many number-ones as a solo act. "Causing a Commotion" was released as the second single, and reached number two on the Hot 100. "The Look of Love" was a European market-only release, reaching the top ten in United Kingdom. Another track, "Turn It Up" was a promotional release in United States, reaching number 15 on the dance charts. Who's That Girl received further promotion from the successful Who's That Girl World Tour. "I had a lot in common with Nikki. She's courageous and sweet and funny and misjudged. But she clears her name in the end, and that's always good to do. I'm continuously doing that with the public. I liked Nikki's tough side and her sweet side. The toughness is only a mask for the vulnerability she feels inside." However, in the light of the bad publicity surrounding Madonna and her then husband Sean Penn, coupled with the fact that their drama film Shanghai Surprise had failed commercially, she had to fight hard to persuade Warner Bros. to green light the project. She also wanted her close friend James Foley to direct the film, proclaiming him to be a "genius". Foley had previously directed the music videos of her songs "Live to Tell", "Papa Don't Preach" and "True Blue". Warner Bros. were looking for another way to cash in upon Madonna's success with soundtracks, and felt that her name alone might be enough to guarantee the success of the film as well as its soundtrack. So they felt that they had no choice, but to green light the project. Filming began in October 1986, in New York, but it was not until January 1987 that Madonna started working on the soundtrack. "I had some very specific ideas in mind, music that would stand on its own as well as support and enhance what was happening on screen and the only way to make that a reality was to have a hand in writing the tunes myself... The songs aren't necessarily about Nikki or written to be sung by someone like her, but there's a spirit to this music that captures both what the film and the characters are about, I think." —Madonna talking about the music of the film. Having some specific ideas in her mind about the music of the film, Madonna contacted Patrick Leonard and Stephen Bray, who had helped to write and produce her third studio album True Blue in 1986. Madonna explained to them that she needed an uptempo song and a downtempo song. As per her demands, Leonard developed the uptempo song. Madonna came to the recording studio one Thursday, and Leonard handed her a cassette of a recording of the chorus, which he had just finished working on. Madonna went to the backroom and completed the melody and the lyrics of the song, while Leonard worked on the other parts of it. After finishing the lyrics, Madonna decided to name the song "Who's That Girl", and changed the title of Slammer to the same, considering it to be a better name. In Fred Bronson's book The Billboard Book of Number 1 Hits, Leonard explained that the song was recorded in one day with Madonna recording her vocals only once. Additional guitar and percussion tracks were added later by Leonard and Bray. The downtempo song was developed on the following day, with Madonna writing the lyrics and Leonard composing the melody. Named "The Look of Love", the song contains the line "No where to run, no place to hide. From the look of love, from the eyes of pride". Madonna was inspired by the look that actor James Stewart gave actress Grace Kelly in the 1954 film Rear Window. Madonna said: "I can't describe it, but that is the way I want someone to look at me when he loves me. It's the most pure look of love and adoration. Like surrender. It's devastating." After "The Look of Love", Madonna went on to develop two further songs with Bray as the producer. The first was called "Causing a Commotion", and was inspired by Penn and the couple's often tumultuous relationship. Madonna felt that her marriage to Penn was on the verge of breaking-up, due to Penn's abusive and violent nature. In a Rolling Stone article dated September 10, 1987, Madonna spoke about Penn's impact on her life and the song: "I don't like violence. I never condone hitting anyone, and I never thought that any violence should have taken place. But on the other hand, I understood Sean's anger and believe me, I have wanted to hit him many times. I never would you know, because I realize that it would just make things worse. [...] I felt like he was 'Causing a Commotion' to purposefully distract me. I wrote this song and vented my frustration in it." The last song developed was "Can't Stop", a track inspired by Sixties Motown and the group Martha and the Vandellas. In addition to this, the album also included tracks by some acts on Warner Bros. Records, namely Club Nouveau, Scritti Politti and Michael Davidson. Commercially unsuccessful and unknown in the US, these groups needed a platform to project their songs, and including them in a Madonna album seemed like the right thing to do for Warner. Two tracks by Duncan Faure and Coati Mundi were included on the soundtrack at the request of Madonna since they were her friends. Despite her only performing four of the nine tracks on the album, Who's That Girl was marketed as a Madonna album, with only her face and name appearing on the cover art. A sample to Madonna's "Who's That Girl", where the lyrics for the chorus include Spanish words. The title track is composed in Madonna's typical style—mixing a drum machine, bubbling bass synth line, and the sound of stringed instruments. According to Rikky Rooksby, author of The Complete Guide to the Music of Madonna, the three parts of the song, namely the bridge, where Madonna sings "what can help me now", the chorus and the verse flow together in a coherent manner, with the chorus incorporating a haunting effect. The song epitomized Madonna's interest with Hispanic culture that continued after the release of her 1987 single "La Isla Bonita". Leonard and Madonna had added Spanish phrases in the chorus, over the trumpets of the second verse, and also in the added instrumental break in the middle. "Who's That Girl" also makes use of the sonic effect brought about by the combination of multiple vocal lines, which had been previously used by groups like The Beach Boys in their singles "God Only Knows" (1966) and "I Get Around" (1964) as well as R.E.M. 's singles "Fall on Me" (1986) and "Near Wild Heaven" (1991). "Who's That Girl" employs this effect on the last chorus where three or four different vocal hooks are intertwined. The second track "Causing a Commotion" has a danceable, up-tempo groove. The musical arrangement consists of a number of hooks interpolating with each other. It begins with the chorus, where Madonna sings the line "I've got the moves baby, You've got the motions, If we got together we be causing a commotion." The verses are accompanied by a four-note descending bassline and interjecting staccato chords. The lyrics make reference to Madonna's 1985 single "Into the Groove" and have three parts to the vocal harmony. According to the sheet music published at Musicnotes.com by Walt Disney Music Company, the song is set in the time signature of common time with a tempo of 192 beats per minute. It is composed in the key of B♭ major with Madonna's voice spanning from the high-note of C3 to B5. The song has a basic sequence of B♭–Fm7–B♭–F9–B♭6 as its chord progression. "The Look of Love" starts off with a low bass synth line and a slow backing track. It is followed by the sound of percussion and a high register note, contrasting with the bassline. The song continues in this way until the last verse, which is backed by the sound of an acoustic guitar. A two-part vocal is found in the line "No where to run, no place to hide". Rooksby felt that Madonna's voice sounded "expressive" when she sings the line "From the look of love" and utters the word "look" over the D minor chord present underneath. The word is sung in a higher note of the musical scale, thus giving an impression of the suspension like quality of the minor ninth chord, dissociating it from the harmony of the other notes. The song is set in the time signature of common time, with a moderate tempo of 80 beats per minute. It is composed in the key of D minor, with Madonna's voice spanning the notes C5 to B♭3. "The Look of Love" has a basic sequence of C–Dm–Fm–B as its chord progression. "Can't Stop" has a high pitched keyboard sound embedded in between the sound of a drum machine and clarinet. The lyrics essentially refer to the idea that "I want my man and I am going to get him whatever". Rooksby noticed that the instrumental break in the song repeats the chorus, with a synth line added on the top. He felt that "Can't Stop", at 4:45 length, was a good example of the division of Madonna's songs between dance music—where the length is important—and the requirement of classic pop songs, which can vary from two minutes to four minutes. J. Randy Taraborrelli, in his book Madonna: An Intimate Biography, described Faure's song "24 Hours" as a slow track which fails to build up momentum. Joe Brown from The Washington Post described Davidson's "Turn it Up" as consisting of a slow background synth, that transforms into a rapidly progressing beat, with Davidson's singing reminiscent of the Beastie Boys. Madonna performed "Who's That Girl", "Causing a Commotion," and "The Look of Love" on her 1987 Who's That Girl World Tour. It was her second concert tour, promoting True Blue and the soundtrack. Madonna trained herself physically with aerobics, jogging and weight-lifting, to cope with the choreography and the dance routines. For the costumes, she collaborated with designer Marlene Stewart, expanding on the idea of bringing her music video characters to life onstage. The stage was huge, with four video screens, multimedia projectors and a flight of stairs in the middle. Leonard became the music director and encouraged Madonna to go with the idea of rearranging her older songs and presenting them in a new format. Madonna named the tour 'Who's That Girl', after looking up at a gigantic image of herself projected on a screen on the stage during rehearsals. The show consisted of seven costume changes, with song-and-dance routines with an encore consisting of the title song "Who's That Girl" and "Holiday". The tour also addressed social causes like AIDS, during "Papa Don't Preach". Who's That Girl tour was critically appreciated and was a commercial success, grossing a total of US $25 million, with Madonna playing in front of 1.5 million people over the course of the tour. According to Pollstar, it was the second top female concert tour of 1987, behind Tina Turner's Break Every Rule Tour. Madonna performing the soundtrack's title track, during the Who's That Girl World Tour. 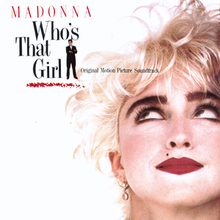 "Who's That Girl" was released as the lead single from the soundtrack, on June 30, 1987. A latin pop influenced song, it became Madonna's sixth single to top the Billboard Hot 100 chart, making her the first artist to accumulate six number-one singles in the 1980s, and the first female performer to get that many number-ones as a solo act. It also reached the top the charts in United Kingdom, Canada, Netherlands, Ireland and Belgium. In the music video Madonna did not portray her film character Nikki Finn, instead she continued with her Hispanic look from the "La Isla Bonita" music video. This time she appeared dressed boyishly in a wide-brimmed Spanish hat and bolero jacket—a combination which would later become a fashion trend. "Who's That Girl" was nominated for "Best Song From A Motion Picture" at the 1988 Grammy Awards and "Best Original Song" at the 1988 Golden Globe Awards. The album's second single, "Causing a Commotion", was released on August 25, 1987. It was criticized by music reviewers for being a sub-standard Madonna single, but enjoyed commercial success, reaching the top ten in New Zealand, Switzerland and the United Kingdom. In the United States, the single quickly climbed up the chart, ultimately peaking at number two in the week of October 24, 1987, the same week Michael Jackson's "Bad" advanced to the pole position. It remained in second position for three weeks, before descending from the chart. "Causing a Commotion" reached the top of the Hot Dance Club Play chart. The third song released from the album was the European single, "The Look of Love". In the United Kingdom, "The Look of Love" was released on December 12, 1987, and entered the UK Singles Chart at number 15. The next week, it reached a peak of nine on the chart, her first single to miss the top five since "Lucky Star" (1984). "Turn It Up" was released as a single prior to its inclusion in the album in 1987. Described by Joe Brown of The Washington Post as "gratingly banal" and its singer as "one of Madonna's photogenic protegés", the song was a success on the Dance Club charts of Billboard, peaking at number 15. The soundtrack album was not well received by music critics, some of whom went on comment that the title track is the record's highlight. Jim Farber from Entertainment Weekly gave a negative review, though Noah Robischon from the same magazine complimented the title track, saying that Madonna had "pushed synergy over the borderline." Bill Lamb from About.com said that the songs were not among Madonna's best music. Taraborrelli commented that "the soundtrack was once again the reminder of Madonna's power and status as one of the most important singers of the 80s, because it was only her songs which gained prominence, albeit not being her best, though 'The Look of Love' is an exotic ballad." Author Mary Cross, in her biography Madonna: A Biography said that "the soundtrack slips up because of the film." Allen Metz and Carol Benson, authors of The Madonna Companion: Two Decades of Commentary, said that "Who's That Girl has done what it was released for, put money in Warner's pockets, but [adds] nothing in Madonna's catalogue". Stephen Thomas Erlewine noted in his review for Allmusic that "In the strictest sense [the record] isn't a Madonna album — it's a soundtrack album", adding that it features "competent but uninspiring dance-pop by [various artists]". David Denby from New York magazine commented that "there's nothing absolutely wrong with the soundtrack. But it's just that it has the misfortune of being associated with such an unfortunate movie, that the album actually does not hold up to you well." He added that "The Look of Love" was a hidden gem in Madonna's catalogue. Don Shewey from Rolling Stone commented that "although essentially a Madonna album, the soundtrack does not boast a truly memorable song, rather there is the inclusion of the failed Warner artist songs, like the Coati Mundi song 'El Coco Loco' and Duncan Faure's uncannily Beatles-esque "24 Hours". For most buyers though this album is the new Madonna album." Robert Christgau gave the album a (C–) and said "From Scritti Politti and Coati Mundi you expect trickier spin, but they're outsiders, and outsiders times soundtrack equals contract work. For her own movie, though, the decade's purest pop icon should do better than sloppy seconds. Or neat seconds—worse still." Ed Blank from Pittsburgh Press commented: "It feels like the sole purpose to create the soundtrack was to show it in the film." Jay Boyar from Orlando Sentinel praised the songs on the soundtrack, claiming that "Madonna brings forth a heart-breaking warmth in 'The Look of Love' and a club stomping feel with 'Causing a Commotion'. With the movie's fate being sealed, luckily for her Madonna can sing." Gyan Singh from The Miami Herald, while reviewing the film, said that the "Only solace of the movie is the soundtrack, the songs—especially those by Madonna—are actually good." Don McLeese from Chicago Sun-Times, while reviewing Madonna's Who's That Girl World Tour, said that "the soundtrack's songs sound good live". Larry Geller from The Advocate gave a positive review, saying that "Who's That Girl will be the soundtrack album of the summer." Stephen Holden from The New York Times gave an equally positive review, saying that the "soundtrack album is full of engaging pop fluff. One of the hottest singles of the year, Madonna's bilingual title song has the buoyant bounce of an acrobat doing somersaults on a trampoline. 'The Look of Love' is as memorable a ballad as [Madonna's 1986 single] 'Live to Tell', and '24 Hours', sung by Duncan Faure, skillfully fuses Beatles-styled vocals with 80's synthesizer-pop underpinnings." Daniel Brogan from Chicago Tribune said that "since this soundtrack isn't really a Madonna album, this is no surprise that it appears as incomplete." After its release, the album debuted on the Billboard 200 at number forty-six on August 15, 1987, the same week that the title song "Who's That Girl" reached the top of the Billboard Hot 100. In the week ending September 12, 1987, the record reached its peak position at number seven. It remained on the chart for twenty-eight weeks, and was certified platinum by the Recording Industry Association of America (RIAA) for shipments of one million copies across the United States. Who's That Girl sold 1.5 million copies across the nation. In Canada, the album debuted at eighty-five on the RPM Albums Chart, on August 1, 1987. After seven weeks, the soundtrack climbed to its peak of four on the chart. The soundtrack was placed at position thirty-seven, on the RPM Top 100 Albums for 1987 chart and was present on the chart for thirty weeks. In the United Kingdom, the album debuted and peaked at number four on the UK Albums Chart on August 1, 1987, becoming the highest debut of the week. It fell out one place the next week, where it stayed for other three weeks. Who's That Girl was present on the chart for twenty-five weeks and was certified platinum by the British Phonographic Industry (BPI) for shipments of 300,000 copies across the United Kingdom and eventually sold 320,000 in the country. The album was less successful in Australia, where it debuted and peaked at number twenty-four, and was certified gold by the Australian Recording Industry Association (ARIA), for shipments of 35,000 copies. It entered the New Zealand Album chart at twelve on September 6, 1987. After two weeks, the album reached its peak at number six. In Austria, Who's That Girl became the best selling debut of the week, charting at number seven, on August 15, 1987, ultimately reaching number five. In Germany, Who's That Girl debuted at the top of the charts, remaining there for two weeks and earning a gold certification from BVMI. The album also reached the top of the charts on the European Top 100 Albums chart. The album also reached the top-ten of the charts in France, Italy, Japan, Netherlands, Norway, Spain, Sweden and Switzerland. The album went on to sell six million copies worldwide. ^ Lawson, Senegal (September 10, 1987). "Madonna: She's That Girl". Rolling Stone. 1019 (32). ISSN 0035-791X. ^ "Digital Sheet Music – Madonna Ciccone – Causing a Commotion". Musicnotes.com. ^ "Digital Sheet Music – Madonna Ciccone – The Look of Love". SheetMusicPlus. Warner Bros. Records. ^ a b Brown, Joe (September 2, 1987). "The Miami Movement; Three New Albums With Salsa's Strong Flavors". The Washington Post. Retrieved November 19, 2010. ^ Farley, Chris (August 5, 1987). "Madonna's Moves Are The Stuff Of Shabba-Doo". Chicago Tribune. Retrieved July 8, 2010. ^ Ayers, Ann (July 3, 1987). "Dressing Up A Material Girl". USA Today. Retrieved July 14, 2010. ^ Goddard, Peter (July 3, 1987). "Who's That Girl? Madonna-mia!". Toronto Star. Retrieved July 12, 2010. ^ Zamost, Scott A; Snead, Elizabeth (July 2, 1987). "New Madonna Tour Sets Racy Tone". Chicago Tribune. Retrieved July 12, 2010. ^ Bassets, Luis (August 31, 1987). "Madonna convocó en París a 130.000 personas". El País (in French). Madrid: Ediciones El Pais S.L. Retrieved May 4, 2009. ^ "Billboard – Artist Chart History – Madonna". Billboard. Retrieved August 25, 2010. ^ a b DeKnock, Jan (August 22, 1987). "Madonna Soars to Top of the Charts for the Sixth Time". Chicago Tribune. Retrieved February 1, 2009. ^ "Charts Stats – Madonna – Who's That Girl". The Official Charts Company. Retrieved December 20, 2010. ^ "Top Singles – Volume 46, No. 21, August 29, 1987". RPM. RPM Library Archives. August 29, 1987. Retrieved April 25, 2009. ^ "De Nederlandse Top 40 – week 31". Dutch Top 40 (in Dutch). Radio 538. 1987. Retrieved April 25, 2009. ^ "The Irish Charts – All there is to know". Irish Recorded Music Association. July 9, 1987. Retrieved April 25, 2009. ^ "Radio 2 – Top 30 van zaterdag 08 augustus 1987". VRT Top 30. Archived from the original on April 9, 2012. Retrieved December 20, 2010. ^ Canby, Vincent (August 23, 1987). "Film View; In Search of Madonna's Persona". The New York Times. Retrieved August 25, 2010. ^ a b c d Erlewine, Stephen Thomas. "Who's That Girl > Review". AllMusic. Retrieved August 4, 2010. ^ "Madonna – Causing a Commotion (Song)". Ultratop 50. Hung Medien. Retrieved May 10, 2010. ^ "Singles Chart For Week up to 19/09/1987". The Official Charts Company. September 19, 1987. Retrieved August 25, 2010. ^ "The Billboard Hot 100: Week Ending October 24, 1987". Billboard. October 24, 1987. Retrieved May 10, 2010. ^ "Billboard Hot Dance Club Songs: Week Ending October 31, 1987". Billboard. October 24, 1987. Retrieved May 10, 2010. ^ "Singles Chart For Week up to 12/12/1987". The Official Charts Company. December 12, 1987. Retrieved May 14, 2010. ^ "Singles Chart For Week up to 12/19/1987". The Official Charts Company. December 19, 1987. Retrieved May 14, 2010. ^ Davidson, Michael (1987). "Turn It Up" (Media notes). Sire. 928 219-7. ^ Madonna, the Rolling stone files: the ultimate compendium of interviews, articles, facts, and opinions from the files of Rolling stone. Hyperion. 1997. p. 74. ISBN 9780786881543. ^ "Who's That Girl > Charts & Awards > Billboard Singles". AllMusic. Retrieved August 25, 2010. ^ a b Christgau, Robert. "Consumer Guide: Who's That Girl". Robert Chritsgau Official Website. Retrieved August 21, 2010. ^ a b Farber, Jim (July 20, 2001). "Madonna's discography". Entertainment Weekly. Retrieved November 5, 2009. ^ a b Denby, David (August 24, 1987). "Movies: Southern Comfort". New York. New York Media LLC. 20 (33). ISSN 0028-7369. ^ a b Holden, Stephen (August 21, 1987). "Pop and Jazz Guide Review". The New York Times. Retrieved August 20, 2010. ^ a b Shewey, Don (September 12, 1987). "Madonna, The Rolling Stone Files". Rolling Stone. pp. 121–122. Retrieved August 20, 2010. ^ Robischon, Noah (July 20, 2001). "Dating Madonna". Entertainment Weekly. Retrieved August 20, 2010. ^ Lamb, Bill (January 9, 2009). "Madonna Discography: Annotated List of Madonna's Albums". About.com. Retrieved August 20, 2010. ^ Blank, Ed (August 6, 1987). "Who's That Girl? Another Madonna Loser". Pittsburgh Press. ^ Boyar, Jay (August 10, 1987). "Luckily For Her, Madonna Can Sing". Orlando Sentinel. Retrieved August 20, 2010. ^ Singh, Gyan (August 7, 1987). "And The Chase's On, Material Girl Madonna Makes A Mess". The Miami Herald. Retrieved August 12, 2010. ^ McLeese, Don (July 12, 1987). "Who Is This Girl". Chicago Sun-Times. Retrieved August 20, 2010. ^ Geller, Larry (August 7, 1987). "Madonna film spawns guess what? A soundtrack". The Advocate. Here Media Inc. Retrieved August 20, 2010. ^ Brogan, Daniel (August 7, 1987). "'Causing Commotion' Best, But 'That Girl's' Just Okay". Chicago Tribune. Retrieved August 25, 2010. ^ "The Billboard 200: Week Ending August 15, 1987". Billboard. August 15, 1987. Retrieved August 17, 2010. ^ a b c "Billboard – Madonna – Who's That Girl". Billboard. Retrieved August 12, 2010. ^ a b "American album certifications – Madonna – Who's That Girl". Recording Industry Association of America. Retrieved July 8, 2016. If necessary, click Advanced, then click Format, then select Album, then click SEARCH. ^ "Top Albums/CDs – Volume 46, No. 17, August 01 1987". RPM. RPM Library Archives. August 1, 1987. Retrieved August 23, 2010. ^ "Top Albums/CDs – Volume 46, No. 23, September 12, 1987". RPM. RPM Library Archives. September 12, 1987. Retrieved August 23, 2010. ^ "Top 100 Albums of '87". RPM. RPM Library Archives. December 26, 1987. Retrieved August 23, 2010. ^ "Top Albums/CDs – Volume 47, No. 20, March 05 1988". RPM. RPM Library Archives. March 5, 1988. Retrieved August 23, 2010. ^ a b "Album Chart For Week Up To 01/08/1987". Official Charts Company. August 1, 1987. Retrieved August 18, 2010. ^ "Album Chart For Week Up To 08/08/1987". Official Charts Company. August 8, 1987. Retrieved August 18, 2010. ^ a b "British album certifications – Madonna – Who's That Girl". British Phonographic Industry. Retrieved July 8, 2016. Select albums in the Format field. Select Platinum in the Certification field. Type Who's That Girl in the "Search BPI Awards" field and then press Enter. ^ Gettleman, Patty (July 14, 1989). "From Projector To Platter, Movie Soundtracks Are Now Pop Music Staples". Orlando Sentinel. Retrieved September 8, 2010. ^ a b c Kent, David (1993). Australian Chart Book 1970–1992 (Illustrated ed.). Sydney: Australian Chart Book. p. 444. ISBN 0-646-11917-6. ^ "New Zealand Albums Chart". Recording Industry Association of New Zealand. Hung Medien. September 6, 1987. Retrieved August 21, 2010. ^ a b c d "Austriancharts.at – Soundtrack / Madonna – Who's That Girl" (in German). Hung Medien. Retrieved July 23, 2017. ^ "Austria Top 40 – Alben Top 75". International Federation of the Phonographic Industry. Hung Medien. August 15, 1987. Retrieved August 21, 2010. ^ a b "Offiziellecharts.de – Soundtrack / Madonna – Who's That Girl" (in German). GfK Entertainment Charts. Retrieved July 23, 2017. ^ a b "Gold-/Platin-Datenbank (Madonna; 'Who's That Girl')" (in German). Bundesverband Musikindustrie. Retrieved July 8, 2016. ^ a b "European Top 100 Albums". Billboard. 99 (40). October 3, 1987. ISSN 0006-2510. ^ a b "French Albums Chart: Search for Madonna" (in French). Syndicat National de l'Édition Phonographique. September 12, 1987. Archived from the original on June 22, 2012. Retrieved August 13, 2010. ^ a b "Madonna: Discografia Italiana" (in Italian). Federation of the Italian Music Industry. Retrieved May 31, 2010. ^ a b "マドンナ Japanese Albums Chart" (in Japanese). Oricon. October 2, 1987. Retrieved August 12, 2010. ^ a b c Salaverri, Fernando (September 2005). Sólo éxitos: año a año, 1959–2002 [Only hits: year by year, 1959–2002] (1st ed.). Spain: Fundación Autor-SGAE. p. 148. ISBN 84-8048-639-2. ^ "Top RPM Albums: Issue 0871". RPM. Library and Archives Canada. Retrieved July 23, 2017. ^ "Dutchcharts.nl – Soundtrack / Madonna – Who's That Girl" (in Dutch). Hung Medien. Retrieved July 23, 2017. ^ Pennanen, Timo (2006). Sisältää hitin. Keuruu: Otava. p. 201. ISBN 951-1-21053-X. ^ "Norwegiancharts.com – Soundtrack / Madonna – Who's That Girl". Hung Medien. Retrieved July 23, 2017. ^ "Charts.org.nz – Soundtrack / Madonna – Who's That Girl". Hung Medien. Retrieved July 23, 2017. ^ "Swedishcharts.com – Soundtrack / Madonna – Who's That Girl". Hung Medien. Retrieved July 23, 2017. ^ "Swisscharts.com – Soundtrack / Madonna – Who's That Girl". Hung Medien. Retrieved July 23, 2017. ^ "Jahreshitparade 1987". Austriancharts.at. December 15, 1987. Retrieved October 2, 2018. ^ "RPM Top 100 Albums of 1987". RPM. Retrieved October 2, 2018. ^ "Dutch charts jaaroverzichten 1987". Dutchcharts.nl. Retrieved October 2, 2018. ^ "Les Albums (CD) de 1987 par InfoDisc" (in French). infodisc.fr. Retrieved October 2, 2018. ^ "Top 100 Album-Jahrescharts". GfK Entertainment (in German). offiziellecharts.de. Retrieved December 5, 2015. ^ "Hit Parade Italia - Alben 1987". Hitparadeitalia.it. FIMI. Retrieved October 2, 2018. ^ "Schweizer Jahreshitparade 1987". Hitparade.ch. Retrieved October 2, 2018. ^ "Brazilian album certifications – Madonna – Who's That Girl" (in Portuguese). Associação Brasileira dos Produtores de Discos. Retrieved July 8, 2016. ^ "Les Meilleures Ventes de CD / Albums "Tout Temps"" (in French). InfoDisc. Retrieved February 13, 2019. ^ "French album certifications – Madonna – Who's That Girl" (in French). Syndicat National de l'Édition Phonographique. Retrieved July 8, 2016. ^ "IFPIHK Gold Disc Award − 1989". IFPI Hong Kong. Retrieved July 8, 2016. ^ "Dutch album certifications – Madonna – Who's That Girl" (in Dutch). Nederlandse Vereniging van Producenten en Importeurs van beeld- en geluidsdragers. Retrieved July 8, 2016. Enter Who's That Girl in the "Artiest of titel" box. ^ Scapolo, Dean (2007). The Complete New Zealand Music Charts 1966–2006 (Illustrated ed.). Maurienne House. ISBN 978-1-877443-00-8. This page was last edited on 13 February 2019, at 10:56 (UTC).